Type 2 diabetes is a condition characterised by generally raised levels of sugar (glucose) in the bloodstream. One of the issues here is the ability of glucose to bind to and damage proteins in the body (glycation), which can increase the risk of a range of complications including nerve damage, eye damage, kidney disease and cardiovascular conditions such as heart attacks and strokes. Diabetics are generally advised to moderate their weight and take regular exercise. A huge study has tested the effectiveness of this advice in terms of its ability to reduce the risk of heart attacks and strokes, and the results were published this week . See here for the full text of the article. Before we look at the results, let’s look at how the study was set up. 5,145 overweight and obese type 2 diabetic were randomised to receive counselling and support regarding diet and exercise (the ‘treatment’ group), or regular diabetes education and counselling. Those in the treatment group were asked to exercise at moderate intensity for at least 175 minutes each week. With regard to diet, they were to aim at an intake of 1,200-1,800 calories a day, and that the diet should contain (as a percentage of calories) less than 30 per cent fat and at least 15 per cent protein. Individuals were followed for up to 13½ years, but the average follow up was 9½ years. At the end of the study, the average weight loss was about 6 kg in the treatment group and about 3.5 kg in the control group. The main aim of this study, remember, was to assess the effect on risk of heart attack and stroke. Unfortunately, no benefits were seen here at all compared to the control group. 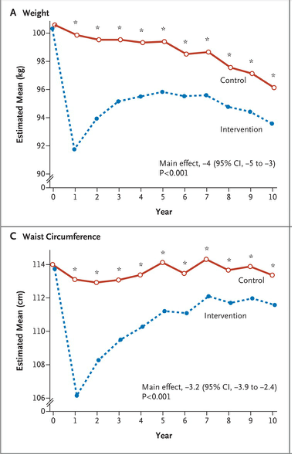 Here are the changes in weight and waist circumference seen in the treatment (blue) and control (red) groups over the course of the study. Take a look at this next graph, which charts levels of ‘glycated haemoglobin’ (also known as ‘HbA1c’). This measure gives us an indication of overall blood sugar control over the preceding 3 months or so. After an initial fall, HbA1c levels gradually climb again and end up essentially where they started. While a 6 kg weight loss looks good on the scales, if this didn’t come from fat (and perhaps came more from muscle) and if blood sugar control did not improve then perhaps we should not be too surprised that the intervention did not work to reduce the risk of heart attacks and strokes. What might explain these duff results? Lots of things, potentially, but one thing that sticks out to me is the dietary intervention deployed here. 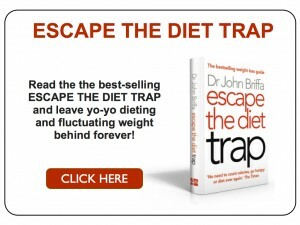 Essentially, what we have here is a reduced calorie, low-fat diet. The issue with such a diet is that it will, almost inevitably, cause individuals to put more emphasis on carbohydrate rich foods. In fact, as a general rule, diabetics are often advised to base their diet on carbohydrate including starchy carbohydrates. But it’s a plain and simple fact that starch is essentially made up of glucose molecules, and many starchy foods are, weight for weight, about as disruptive to blood sugar levels as table sugar (sucrose). This is not the sort of diet, obviously, that is likely to work well for improved blood sugar control (or weight loss, I think). I don’t rate the chances of such a diet to stave off diabetic complications, either. I feel we’re being sold short here. My experience in practice is that low-fat diets (such as the one recommended here) do indeed give modest or insignificant weight loss results, but those lower in carbohydrate (and less restricted in fat) very often lead to substantial weight loss and significantly improved blood sugar control in type 2 diabetics. I scoured the paper to see if at any point it occurred to the authors that the prescribed diet might actually be the explanation for the poor results found in this study. I was disappointed, though: not only was this idea not mooted, there was not even one single reference to carbohydrate in the whole study. There’s not a single reference to sugar or starch, either. Diabetes is essentially a problem of carbohydrate intolerance. This huge, multimillion dollar study assessed the impact of lifestyle interventions including diet on diabetics. Quite how the write-up of this study managed to omit any reference to carbohydrate at all is anyone’s guess. But there you have it. Check out a piece I wrote some months ago when this Look Ahead Trial was abandoned, for being a waste of time and a huge amount of money. The problem with far too many medics, is the fact that HbA1c makes all the difference in the world for a diabetic and staying complication free, so many medics have yet to learn this fact. $220 million well spent ! Proves NHS,DUK,ADA dietary information for type two diabetics useless ! The most damning piece of information regarding diet for type two diabetics, I have ever read in four years of studying type two diabetes, was the complete failure of the Look Ahead Trial to improve CVD outcomes for type two diabetics. By using a modest reduction in weight and calorie reduction, the trial participants were on a 55% carb diet, the trial was doomed to fail from day one ! I am wading through a mass of information, but one thing stands out a mile, the pitiful reduction in HbA1c. The participants had a top HbA1c of eleven at the start of the trial, higher numbers excluded from taking part. After 11 years of a 13 year trial it was deemed ‘futile’ to continue. No benefits in outcomes regarding CVD among the participants was found. Average HbA1c reduction 0.5% and the boffins expected an improvement in CVD, what planet are these people on ! With the correct diet it would be normal to see massive reductions in HbA1c and vastly improved blood glucose control. Huge reductions in obesity, far better lipid counts and huge reductions in medication used. This has been proved countless times by lowcarbing diabetics, and they didn’t need 11 years and $220 million to find out a way to improve CVD. The good news we see on blogs and forums all over the world, counts for nothing with outfits like the NHS,DUK and the ADA, they call the good news reported ‘anecdotal’ they much prefer to accept the information received from big pharma and junk food companies. The fact that many of these outfits have been fined $billions for lying, bribery and corruption and falsifying drug trial evidence matters not a jot. Why, because the people we should be able to trust have sold out, and put money before peoples health and wellbeing. We need far more people like Bernstein, Wortman, Taubes, Kendrick, Briffa et al. They have the courage to stick their heads above the parapet, and refuse to be lackeys and yes men to stupidity and greed. Hi folks, please spare a thought for the Medics, evidently they are ‘perplexed’ as to the best way to treat hyperglycaemia in type two diabetics. The truth is they are perplexed how to treat most conditions in type two diabetics. The $200 million plus Look Ahead Trial proved one thing without a shadow of a doubt. A reduced calorie diet with modest exercise done nothing for type two diabetic outcomes regarding CVD. It also proved the diet of death pushed by the NHS, DUK and ADA i.e. 55% carbs does no diabetic any favours. The other question I’m asking myself is what meds were involved ? Actos, Avandia etc. etc. One thing is for sure, type two diabetics on a 55% carb diet must have made med taking a full time job. Well those good guys at the ADA wanted to ease the burden on these ‘perplexed’ Medics. The Task Force, anyone smelling a rat ? A. Tsapas: has received travel grant, educational grant, research grant and lecture fees from Merck Serono, Novo Nordisk, and Novartis, respectively. The refusal of the diabetes industry to recognize the role of carb intolerance is one of the great tragedies of modern life. 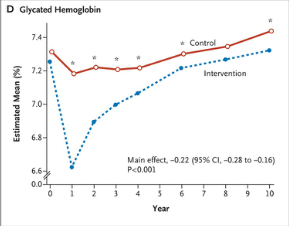 Dr Briffa, you say that the treatment group results are the red curves and the control group results are the blue curves, but the graph labels show that the red curves are the control group results, and the blue curves the intervention (treatment) group results. The study shows that despite initial benefits in the first year, nearly all the improvements were lost in the subsequent years and that the general trends were then the same in the intervention group results and the control group results. However, the differences between the two groups were small: the intervention group had a mean weight only 2.5-3.0 kg lower than the control group, a reduction in waist circumference of only 2.0-2.5 cm and a reduction of only 0.1-0.2% in HbA1c levels. I suspect that the practicalities of exercising for 25 minutes every day when eating only 1,200 to 1,800 calories lost its appeal over the years. It seems to be another depressing study trying to reinforce the belief that people have diabetes because they are overweight, rather than the other way around, perhaps…. I have had type 1 diabetes since 1970 and only going on a low-carbohydrate diet has enabled me to keep my HbA1c under 8.0 (currently around 6.7 and I hope to get it lower). My first drop in A1c after changing diet impressed my board-certified endocrinologist, but he insisted that I was endangering my health unless I ate at least 100 grams of carbohydrate daily. Something about how the brain needs it… I had to move to handle a family emergency and that gave me an excuse to seek other advice. You are right about the blue (treatment) and red (control) groups, and I have amended the post accordingly. Thanks for pointing this out. Yes, I think you’re right – 1,200-1,800 cals per day and the exercise probably did lose appeal for many. Part of the reason can be the effort and hunger required to stick to this sort of regime, especially when one doesn’t seem to be getting the results one would like or expect on the scales. Do we know who funded this study? Maybe that would explain why they didn’t think of looking at carbs? Regarding the impact of diet on diabetes, I came across this just now – I did a quick search on your site but couldn’t find any reference to this study from 2011. Words fail me – what’s next, a study of gluten intolerance that seeks to evaluate the benefits of a weight loss intervention with no measurement of, or reference to, wheat in the diet ? The graphs above are some of the best illustrations of “regressions to the mean” I’ve seen. Nothing to see hear folks, please move on. I took a look over at the ADA’s 2013 meeting proceedings http://app.core-apps.com/tristar_ada13/abstracts/search and was comforted to find that “carbohydrates” as a search term did find some useful work happening out there. How very disheartening, when will the message ever be received and understood. It is so sad that the principle is so utterly utterly simple! By eating low carb and not worrying about fat or calories, I have lost over 3 stones and my bg is normal. My fasting levels are always around 5mm and the other day my post-prandial 2 hours after eating was actually under 5mm! All this has become my norm. Just by restricting carbs I need no medications, no further treatments. so what is the matter with these people, the establishment and the researchers? It has to be vested interests. It grieves my heart to think how much money, misery, lives and time are wasted on futile answers which can never work. To my mind, unless a diabetic eats a low carb diet, full of nutrious protein and fats, they can never control it. I despair! I tell people every now and then about how I eat. They can see how healthy and slim I am, yet their brains will not accept that a diabetic can eat things like full cream, meat, fish, eggs etc and be healthier than ever. The majority of people simply do not realise the damage that starches, bread, potatoes, rice, pasta, cakes, sugar in every form, is doing to them. It is making so many people fat and bringing on diabetes in those who are pre-disposed to it. I think the trouble is, the answer is way to simple! Having said that, though the principle is simple, it is necessary to have discipline, control and thought about one’s diet. I can never step out of line, it has to become the way of life to eat low carb. But it is more than possible, I love and enjoy food more than I have ever done. I used to feel dreadful on a high carb diet – I reckon I was eating maybe 300-400 grams of carbs a day, and that is not untypical of a lot of people. I was fat, tired and despaired of ever looking good again or feeling healthy. Now at age 50, I feel better than I have felt since my 20′s. All due to low carb eating! Quite frankly, I am never at the doctors surgery these days. I don’t need to be there. I am grateful for this. I basically follow the Atkins way of eating and have never looked back. We like to think in this “free society” we live in the u.k. that we are not under the threat of the government for speaking out. How wrong we are. Look at a few examples. Nurses and doctors in health service afraid to “whistle blow” on disgraceful care practices. Care home employees afraid to stand up and reveal the appalling conditions many of our elderly have to suffer. 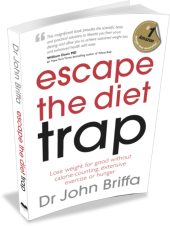 Doctors who for obvious reasons have to continue with outdated medical treatments which with modern research are showing are now wholly unsustainable and in case of LCHF plans possibly damaging in the monitoring and treatment of type 2 diabetes. We all need guide lines in our work of course. But for how much longer will type 2 diabetics have to suffer these guide lines corralling them into a pen that only the drug companies will benefit from, before they are openly treated and in many case cured by LCHF plans. Vanessa, that press release says that “people who go on a very low calorie diet can remove fat which is clogging up the pancreas allowing normal insulin secretion to be restored”. Since when was fat involved in ‘clogging up the pancreas’?? I have a family history of late onset diabetes, and of obesity. At 52 (a year ago) I figured I ought to be checked and although I was OK, at the doctor’s surgery I was told that having a BMI of 29 put me at risk (and I can’t tell you how hard I’d battled with diet and exercise since the age of 13 to even keep it at that). The nurse told me that I should eat wholegrains and no more than a matchbox size piece of cheese per week. I’d estimate her BMI was around 33, so clearly it wasn’t working for her. 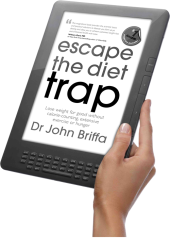 I then spent several weeks trawling the internet, found Gary Taubes and then Dr Briffa’s fab book and site. Within 4 months I’d lost a stone and a half (BMI now 24). A further 9 months on I’ve maintained that weight loss – the first time in my life I’ve been in control of my weight. My friends, husband and family have all been inspired, bought the book, and also easily lost weight. Although I am delighted to have found the ‘magic fix’ (for that’s how it feels to me), I was also angry that I’d been duped for so long. The mainstream advice was so wrong when much of this stuff has been known for years. And it remains that way – 99% of people still believe that the way to lose weight and be healthier is to eat less and exercise more, because that’s what they are being told. So their misery continues, whether just due to their image or more serious health issues like diabetes. And the taxpayer continues having to fund this sort of waste of time study, and the ever increasing demand on the health service. I have been studying this topic for over 40 years and have always proposed a low-carb lifestyle for the same reasons stated in your newsletter. Out of curiosity, I was trained several years ago by Dr. Neal Barnard with the Physician’s Committee for Responsible Medicine to implement a hi-carb vegan diet to address and “cure” diabetes. I still don’t know how it works, but he has results to show it does. I continue to tout a low-carb lifestyle in my practice. With respect Jake, the ‘diabetes industry’ know all about the role of carbs and diabetes. That is why they spend so much money on anti-lowcarb propaganda. If every diabetic lived a lowcarb life style, it would cost big pharma and the ‘diabetes industry’ $billions. You see there is no money in fit and healthy people, there is no money in dead people. 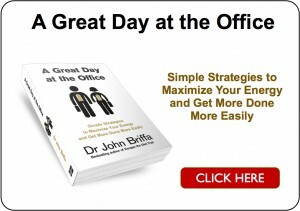 The trick is keeping people alive…..sort of. Countless millions eating the wrong diet supplied by the giant international food organisations, with big pharma supplying the antidote for the poison. It’s money for old rope, I just wish it was my rope. Muni has it 100% right. I am no longer surprised. Since abandoning medical dietary advice and leaving high carbs and low fat behind my HbA1c hovers around 6.0. This is in reality thanks to John Briffa’s advocacy. The point that really engaged my attention was the proposition that carbs were the substance to which type 2′s were intolerant and therefore the advice to load your diet with carbs was contrary to common sense. And in my case so it has proved. My son started having problems with feeling faint and weak on holiday a few weeks ago. He looked up his symptoms and reckoned it was hypoglycaemia. This was confirmed by a GP as “functional hypoglycaemia” when we returned. He’s just turned 16 and has gone through a huge growth spurt (now 5 feet 9 and weighing just 8 stone 6). The doctor said to increase his calorie intake and have lots of snacks like cereal bars. My son researched on the web and though this advice was wrong, and he was really scared that it could be type 1 diabetes. So he’s changed his diet to be high protein and fat (meat, fish, eggs, butter and oil, natural yogurt). He’s cut out sweet things, although is still having complex carbs (he’s a growing lad!) but making sure to combine them with protein, fat and greens. Over the past week he’s not had a hypo attack at all. So it seems there is plenty of advice out there which agrees with what you’re saying. Any other tips for a youngster with hypoglycaemia who wants to gain weight? Thanks. Sorry, forgot to mention lots of cheese. “Since when was fat involved in ‘clogging up the pancreas’? ?” – the Newcastle study was based on observed internal fat deposition (the group are imaging specialists) and the diet was seeking to replicate the reversal of type II diabetes seen in bariatric surgery cases. I think the diet group also received statins at a greater percentage yet no benefit in terms of morbidity, mortality. Shows that lowfat diets as well as statins are a scam in diabetics. They must be happy to have a study that “proves” that “intensive” lifestyle changes just can’t work so pharmaceuticals are the only option. I found it very interesting that when I visited a Diabetic Research Centre yesterday with my Husband, as volunteers, neither one of us were asked about Diet. They commented on my excellent health and shape ( I am not Daibetic) yet Diet never came into it. All the usual cholesterol, weight, height, BP though. I wonder if this is because they are assuming they have their advice right so needs no further research, or because it just does not occur to them that Diet can be the clue! I was told that by my Dr on diagnosis 12 years ago, and proved it by developing a range of complications over the next 7-8 years: chronic tiredness, reduced kidney function, 1st stage retinopathy and then crippling peripheral neuropathy. My active life was over. 5 years ago I started a low carb, increased fat diet, and felt the benefit in weeks. I am now free of all diabetes complications. I shall refer this study to a diabetes research group I am in touch with. The problem is that (nearly) all health professionals “know” that fat in the diet is dangerous, so they could never sponsor a LCHF study as it would be unethical. My BGs still go through the roof. She said, are they wrong, or just barmy? They recommend carbs that just harm me. And my BGs are so well-controlled that when I keep telling my friends & family I just bore-em. Leave a Reply to Ian Day Click here to cancel reply.